Some of the disagreement between these two models is the result of differing philosophies regarding the assessment of biological role in fossil organisms. One of Cartmill's (1974b; 1990; 1992) critiques of GL is that it proposes a unique biological role for primate morphology; he holds that evolutionary events can only be explained if they can be understood as examples of more general phenomena. If no analogies or parallelisms exist, no explanation of the trait is possible. His work on primate origins has thus consisted of employing the comparative method to understand the derived features of primates. There is no doubt that the "comparative method" is a powerful way of elucidating the relationship between "traits" and "behaviors" (or form and biological role in the sense of Bock and von Wahlert, 1965) in both living and fossil organisms. The stronger a correlation between form and biological role (i.e., the more examples of phylogenetically independent co-occurrence), the stronger the inference that the same relationship applied to a taxon or morphotype where the trait is known, but the behavior is not. This is not, however, an infallible line of reasoning since numerous examples of morphological convergence without behavioral convergence are known, as well as behavioral convergence without morphological convergence (Bock, 1977; Rickelfs and Miles, 1994). Because of other factors (allometry, developmental constraints, multiple pathways of adaptation, functional compromise (see Ross et al., 2002 for further discussion), associations rarely exhibit the regularity necessary to deduce biological role from form. The fact that an association between a trait and a behavior exists in living organisms (a population which in itself is a historical accident, not likely to exhibit all the form-function relationships that could possibly exist) is simply no guarantee that the same relationship applied to a fossil or morphotype. In addition to the inductive nature of a "comparative method" argument, both its proponents and detractors recognize that this sort of analogy is powerless to explain unique traits (Lauder, 1982; Rudwick, 1964; Van Valkenburgh, 1994). Furthermore, if an analogy is based only on a few examples, it really has little statistical strength (Garland and Adolph, 1994). If the comparative method were the only avenue available for investigating form and function, one would have to conclude, like Cartmill, that unique events are "inexplicable." This notion is rejected. Relationships between form, function, and behavior can be (and have been) investigated independently of whether or not there are multiple (or any) extant examples. The real power of the comparative method is the demonstration of the strength of a relationship and thus the implication that there is a causal basis to the relationship (Harvey and Pagel, 1991; Losos and Miles, 1994; Rickelfs and Miles, 1994). The pattern is used to infer process—we make the assumption that similar selective regimes arising from similar biological roles result in similar anatomical solutions (Lauder, 1996). Thus, it is the functional/bio-mechanical relationship itself, not the number of examples of it that provides the essential link between a trait and a behavior. These causal links are tested through the analysis of performance (Arnold, 1983; Baum and Larson, 1991; Lauder, 1990; 1996; Wainwright, 1994). In primate biology, both of the explicit strategies for executing the "comparative method" recognize the "functional implication" aspect as an important part of the argument. A hypothesis of biological role is stronger if "All the features specified in the definition of T (traits) have some functional relationship to F (function)" (Kay and Cartmill, 1977, p. 20, italics added); "it is based on two or more morphologically and functionally convergent derived features, which are causally explicable and exclusively correlated with the same biological role" (Szalay, 1981: 167, italics added). The dual importance of both comparison (i.e., analogy) and functional analysis is also recognized by many other primatologists addressing this topic (e.g., Day, 1979; Fleagle, 1979; Lovejoy, 1979; Preuschoft, 1979; Ross et al., 2002). Both the NVP and GL models make use of the comparative method and functional inference and therefore share the strengths and limitations of both (Ross et al., 2002). Establishing a plausible functional and therefore causal, relationship between a trait and a behavior provides at least as compelling evidence for a hypothesis of biological role in an extinct animal as does the demonstration of convergent examples of the association. Some have even argued that if such causal relationships are understood, there is in fact no need to rely on analogy at all (Hesse, 1966; Rudwick, 1964). Analogies are useful for suggesting possible biological roles (i.e., they establish prior probabilities (Fisher, 1985)), and narrow the universe of form-function-biological role hypotheses we may wish to subject to further testing. Others have argued that paradigms and biomechanical models are simply another kind of analogy (e.g., Weishampel, 1995). Regardless, with an understanding of a causal relationship between trait and behavior it really does not matter if there are numerous, few, or no examples among living taxa— "...the range of our functional inferences about fossils is limited not by the range of adaptations that happen to be possessed by organisms at present alive, but by the range of our understanding of the problems of engineering" (Rudwick, 1964, p. 33). Thus, unique traits present no problem for this line of reasoning. (or a morphotype) made of this function i.e., its biological role, is not in principal deducible simply from form (Bock, 1977). Nor is it able to be deduced from analogy or comparison. Nor is the demonstration of a performance benefit in a living model proof that the feature served the same role or gave the same performance benefit in an extinct organism (Koehl, 1996). We can only use these lines of evidence to evaluate the relative probability of competing hypotheses (Fisher, 1985; Ross et al., 2002; Szalay and Sargis, 2001). In this context, the distinction between "function" and biological role clarified by Bock and von Wahlert (1965) becomes important. In this scheme, function is restricted to "the physical and chemical properties arising from its form" (p. 274). What abilities does a particular morphology enhance or constrain? Biological role is how the form-function complex is actually used by the animal in its natural habitat. A form may have numerous functions; whether we would ever be able to work out all of them and their implications for biological roles is a difficult question. The image quality afforded by frontally directed, convergent orbits may be useful, even crucial, for nocturnal visual predators. This fact, however, does not signify that it is not also useful for other activities, such as visually locating any kind of small, cryptic object, or negotiating a complex three-dimensional environment (Clark, 1959; Collins, 1921; Crompton, 1995; Sussman, 1991, 1995; Szalay and Dagosto, 1980; Szalay and Delson, 1979), even if no living animal uses it for that activity. This confounds function (increased visual acuity) and biological role (increased visual acuity is useful for hunting insects, finding small fruits or flowers, performing acrobatic movement in a complex 3-D environment, etc.). 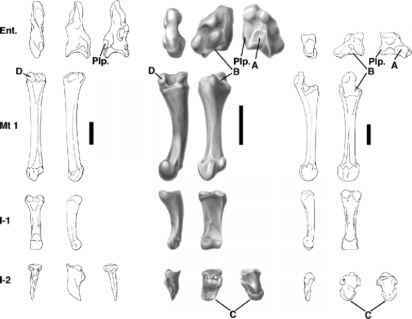 Thus, when evaluating the biological role of fossil organisms (or morphotypes) we are usually left in the position of having several reasonable unfalsified alternate hypotheses. How can we judge between them? Like comparisons, functional implications of form can be used to provide relative levels of support for competing hypotheses of biological role. How good is the "fit" between the performance attributes of the morphology (either inferred or actually tested) and the mechanical demands of the biological role? A serious drawback for the particular problem addressed here is that virtually all the connections between form, function, and biological role for the traits in Table 1 are only inferred from form or by analogy; their performance attributes have not been experimentally tested. (1) Comprehensivity: Does the proposed biological role account for other features of the organism (Rudwick, 1964; Van Valkenburgh, 1994)? (2) Phylogenetic hierarchy: Szalay (1981) has argued that more recently acquired traits will be more reliable predictors of biological role than either retained primitive features or a general assessment of overall morphology. (3) Extant phylogenetic bracket: Witmer (1995) has developed an explicitly phylogenetic model wherein the first two extant outgroups of the fossil taxon of interest can provide constraints regarding the interpretation of the fossil taxon. NVP is corroborated not only by the strength of analogy, since most nocturnal visual predators have greater orbital convergence than their ancestors, but also by its comprehensivity, since it presents a reasonable explanation not only for orbital convergence but also the grasping extremities of primates. The dental evidence is somewhat problematic since it indicates a variety of dietary strategies in the earliest primates (Szalay, 1968; 1972; 1981; Szalay and Delson, 1979). NVP is attempting to explain derived characteristics of primates, but the EPB approach is inconclusive because there are so few extant primates that are nocturnal visual predators, unless this niche is very broadly defined to include any primates for which insects provide an important resource. GL also attempts to explain derived primate morphology. Since GL is a locomotor mode unique to primates, the comparative approach is of limited value. However, the separate elements of the mode, grasping and leaping, do occur in other mammals, and can be evaluated with both the comparative method and functional inference, obviating one of Cartmill's prime objections to the hypothesis. GL is not as comprehensive as NVP; it may explain orbital convergence, but it does not imply any specific dietary regime. Most extant primates leap, but members of the most likely outgroups do not, so the phylogenetic bracket approach yields only equivocal results. None of these other lines of evidence resolve the differences between NVP and GL in their reconstruction of the locomotor mode of the ancestral primate.